Departure at 09.00pm Night Journey to Tirupathi. On arrival Greet and Receive from our IRCTC Tour Guide checkin for fresh up. 09.00am - 11.00am (Approx) move inside to the temple for Darshan of Lord Balaji and time for Shopping. 2+2, Volvo AC, Video Via: Package includes only VIP DARSHAN Rooms provided for fresh up, Breakfast and Lunch, Uphill transfers by link coach, Guide fees and 2 Laddu prasadam per person. Uphill transfers by link coach and Guide fees. Departure at 09.30pm Night Journey to Tirupathi. On arrival Greet and Receive from our IRCTC Tour Guide checkin Hotel for fresh up. 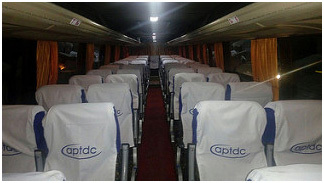 2+2, Volvo, AC, Video Via: ITDC VIP DARSHAN BY A/C VOLVO COACH Package Inclusive of transportation by A/C Volvo coach, Rooms provided for fresh up at Hotel. Breakfast and Lunch provided at DAKSHIN VEG RESTAURANT, An authentic pure Vegetarian Restaurant brings to you the ambiance of a classy restaurant lounge with a Indian flavor. Uphill transfers by link coach, Guide fees and 2 Laddu prasadam per person. Departure at 09.30pm Night Journey to Tirupathi. On arrival Greet and Receive from our ITDC Tour Guide checkin Hotel for fresh up. Note 2: Tariff and package operated by ITDC Tourism operational terms apply.